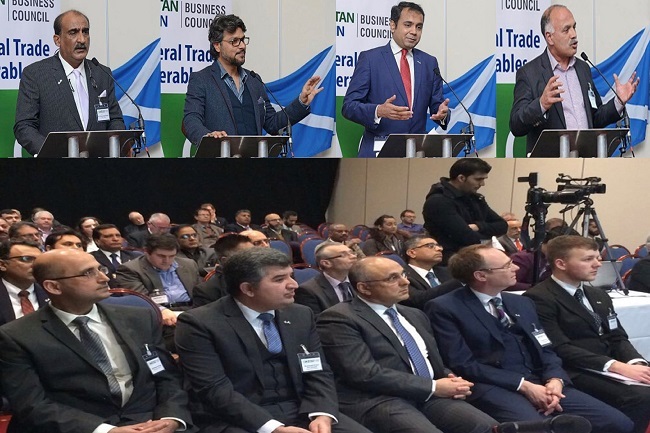 Speakers at “Doing Business in Pakistan” Conference in Glasgow said that Pakistan is brilliantly positioned for investment and called upon the foreign investors to take advantage of the opportunities offered by Pakistan. 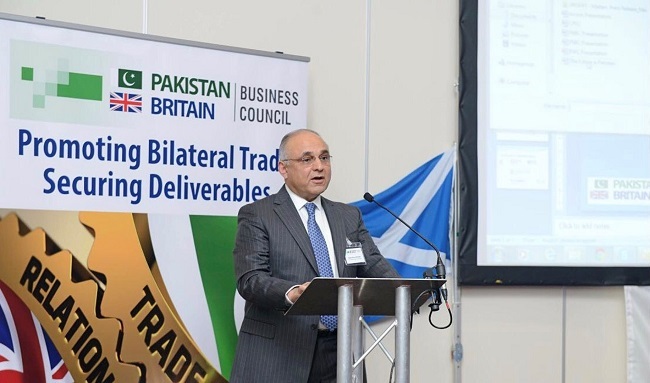 The Conference was organized by Pakistan Britain Business Council (PBBC) in partnership with Scottish Government, Scottish Development International (SDI) and the Pakistan High Commission London on 18 January 2017. 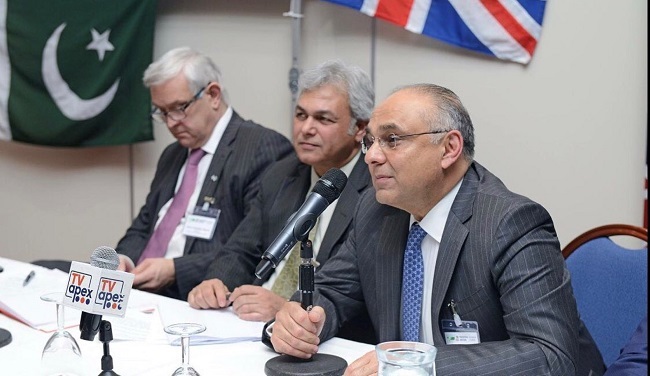 The Conference aimed to encourage and support UK companies considering business opportunities in Pakistan. 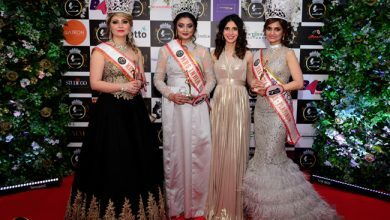 It also focused on business opportunities afforded by China Pakistan Economic Corridor (CPEC). 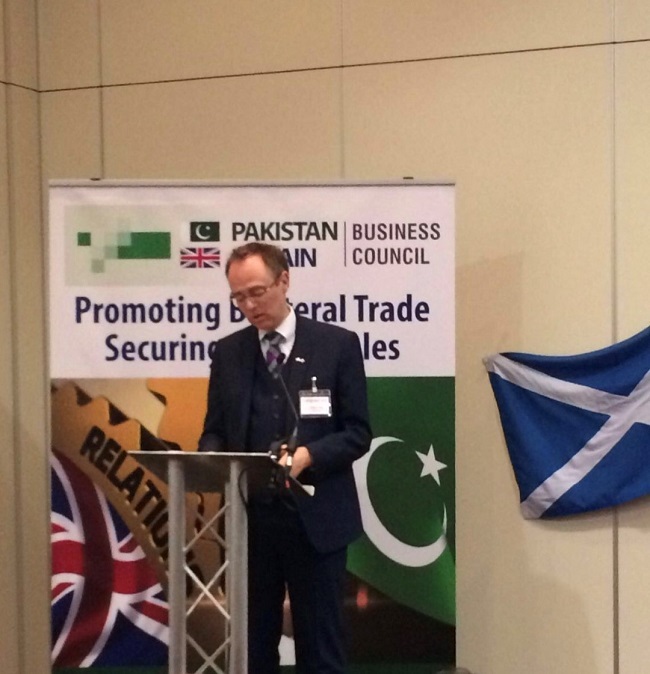 A large number of British, Scottish and Pakistani companies participated in the Conference. 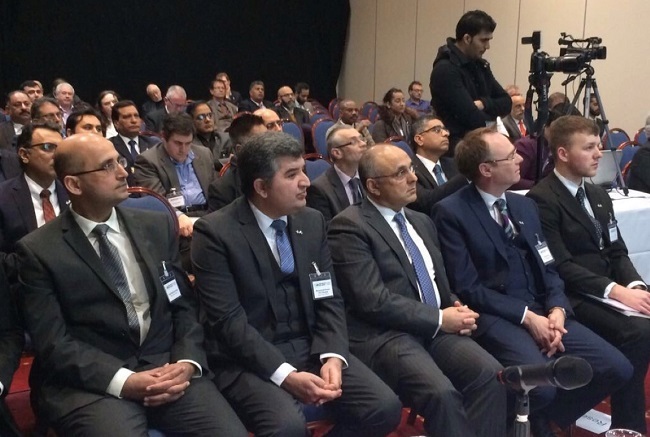 Besides, representatives of the Scottish Government and the FCO attended the Conference. 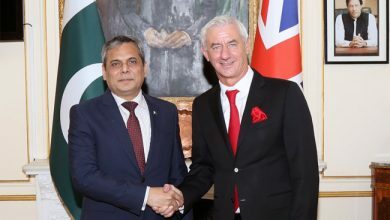 Dr Alasdair Allan MSP, Minister for International Development & Europe said Scotland has strong links with Pakistan and we would like to further develop these links and maximize the opportunities across the themes of education, skills, energy, water, culture, trade, investment and enterprise. Pakistan has been a partner country in our international development strategy and through our International Development Fund we will continue to contribute to strengthen our bilateral relationship through educational scholarships and business and enterprise. Following the outcome of EU referendum, we are committed to promoting our bilateral relations with Pakistan through business. 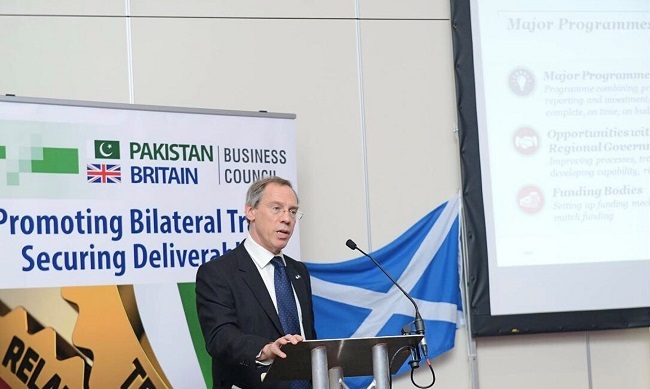 On this occasion, the Minister officially launched Scottish Pakistan Business Council (SPBC) and hoped that through this platform more Scottish companies would be able to successfully access the market of Pakistan. 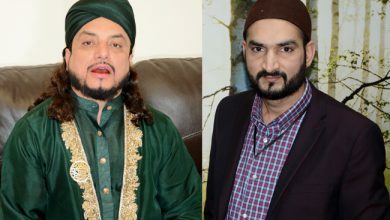 The Minister also recognized the contribution of large and vibrant Pakistani diaspora in Scotland. In his remarks at the Conference, H.E. 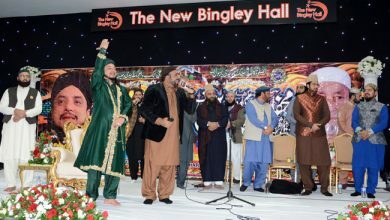 Syed Ibne Abbas, Pakistan High Commissioner to the UK stated that a silent revolution is taking place in Pakistan. Under the government of Prime Minister Muhammad Nawaz Sharif, Pakistan’s economy has turned around. He said: “According to the World Bank, our economic growth for this year is 5.2%. Bloomberg has declared Pakistan Stock Exchange (PSX) as one of the 5 best performing stock exchanges in the world. MSCI has upgraded Pakistan from Frontier Market to Emerging Market. 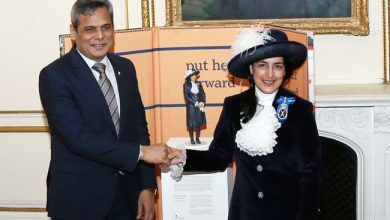 The High Commissioner said the narrative about Pakistan is changing fast and this is driving various countries and foreign investors to explore the business landscape of Pakistan. 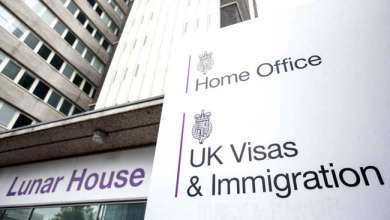 In this regard, he mentioned recently concluded Pakistan visit by British Foreign Secretary Boris Johnson and FCO Minister for Asia and Pacific and the upcoming visit by Lord Mayor of the City of London. 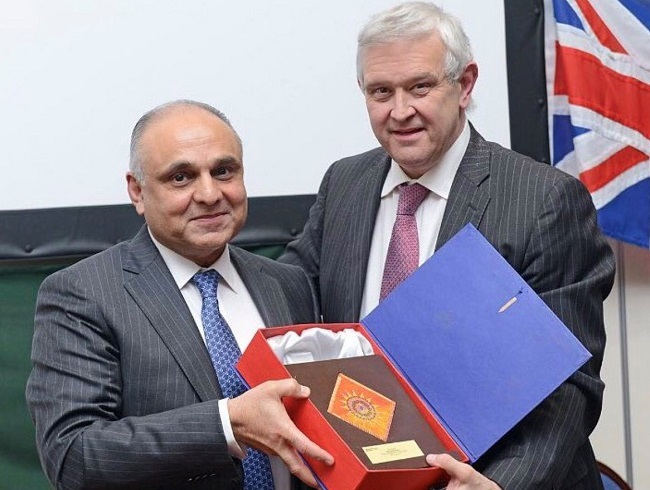 Julian Hamilton Barns, Chairman PBBC said that Pakistan is a big market with enormous business opportunities, especially in the wake of CPEC. He said time is of essence as the early movers would clearly benefit the most. Mr Barns said business opportunities exist at all levels in Pakistan ranging from major infrastructural projects, retailing, energy sector and skill development. He expressed that PBBC wants to establish partnerships with stakeholders in Pakistan for mutual benefit of the two countries. The Conference covered a range of topics including: Perception & Security; Ease of Doing Business; Start-ups and Joint Ventures; Innovation and IT Support; and Business Opportunities on a sector by sector basis. Exciting case studies from companies actively trading and investing in Pakistan were presented. The Conference provided an excellent opportunity to interact with the Panel and for one to one networking with experts, trade advisors, government agencies and business partners. The delegates also interacted with the Pakistan High Commissioner and Government Minister Dr Alasdair Allan. Other speakers included: Gerard Newman, Director PWC; Syed Uzair, Scottish Development International (SDI); Ahmed Zaman Khan, FPCCI; Sheikh Hammad Amjad; Faraz Khan, CEO SEED Ventures; Shahid Azeem, MD Arcom IT; Shoukat Mubarak; and Faisal Jamal Dashti, FPCCI. Given Pakistan’s improved stability and its recent economic growth as announced in recent World Bank reports, PBBC and its members, partners and stakeholders believe that there is tremendous potential to develop business opportunities in Pakistan, particularly following the launch of China Pakistan Economic Corridor (CPEC) projects where the Chinese Government has committed to invest US$ 54 billion in infrastructure and energy sector in Pakistan.